Stopping the flow of special interest campaign dollars starts with understanding how it gets there. Editor’s Note September 2016: Washington state’s democracy reform initiative, which aims to put everyday people back in control of government, is swinging into high gear as the November elections inch closer. But how does big money get into politicians’ pockets in the first place? Here’s our quick and easy primer. Political donations are a tangled web. Convoluted with layers of cryptic reporting categories and disclosure requirements, the public’s understanding of money in politics is often limited at best. Sightline is working to unveil this aspect of modern American politics with an eye toward illuminating how moneyed interests muddle our path to a sustainable future. In that spirit, we’ve created a sort of field guide for understanding how political money can be legally distributed and how that money can be spent by its recipients. Depending on how donors want to give their money (and how much scrutiny they want to be subject to), they can choose among a range of options with a dizzying variety of spending limits and disclosure requirements. The Federal Election Commission (FEC) establishes these limits, and states can add further restrictions just as long as they don’t undermine the limits set by the FEC. In the Northwest, Washington sets several further restrictions beyond the FEC rules (see the full breakdown here), while Oregon is one of only eight states that does not place any additional restrictions on political donations. A direct donation is money given by a donor to a candidate’s campaign with no middlemen or organizations in between. These gifts are capped at $2,500 per election, though you are allowed to donate in both the primary and general elections for a total limit of $5,000. Donors who want to give more can do so, provided that they direct the funds to a candidate’s “leadership PACs,” which have no spending limits. (A political action committee, or PAC, is simply a means of pooling money for a common cause. We’ll delve deeper into them below.) These expenditures must be disclosed to the public—the date, donor’s name, the gift amount, and city and state of origin—though federal election rules only require donors who give more than $200 to candidates or PACs to disclose their identity. Washington adds some further caps and disclosure requirements: individuals can donate no more than $1,900 to a gubernatorial candidate and $950 for a candidate running for the legislature. (Donors are allowed to contribute at this level in both the primary and general elections, so the full amounts rise to $3,800 and $1,900, respectively.) The state’s Public Disclosure Commission also puts a minimum spending amount required for disclosure at $10. Moneyed interests muddle our path to a sustainable future. A party donation is money given to a political party instead of an individual candidate. The party can then spend that money on any candidate, party event, or media buy that it chooses. Although these donations were historically major sources of campaign funding for candidates, they are growing less fashionable. Supplanting them are Political Action Committees (PACs), which have so few restrictions that they’ve taken over as the top source of funding. With PACs, donors can focus their funds more directly on the candidates or issues they care about, leaving the official party apparatuses with far less influence. Donations to national party committees are limited to $33,400 per election cycle. Yet Washington adds a clever and rather unique limit on state parties giving to candidates: the total funding from a party to a candidate cannot exceed more than 80 cents per registered voter in the district. PACs (Political Action Committees) are simply a means to pool money from donors, usually with a focus on a specific issue (Protect Our Guns PAC), a political ideology (I Will Vote Like a Republican Should), or an individual candidate. These types of political donation pools have been around since the 1940s, though they were traditionally organized by employees or large advocacy organizations, like the Teamsters Union, Boeing employees, or League of Education Voters. Since the US Supreme Court’s 2010 Citizens United decision, however, PACs have given rise to so-called Super PACs, which have no restrictions on contribution limits. Super PACs are restricted in other ways, though. Most importantly, they are not permitted to coordinate with candidates or to give money directly to candidate campaigns. 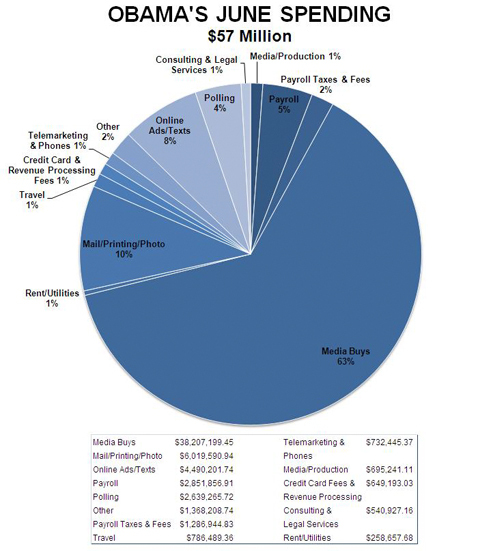 Super PAC money is used for media buys and advertising and, while limited in its scope, this money can be an extremely powerful tool in today’s political campaigns. A donor can even start her own Super PAC, donate her own money to it, and then invite like-minded folks to join in. In the 2012 election, Karl Rove’s American Crossroads GPS Super PAC made headlines for its record-breaking fundraising (as well as its subsequent massive failure to get its preferred candidates elected). Travel. From flying around the country to chartering buses for hauling staff, reporters, and equipment to gas money for volunteers to drive themselves to events. Political consulting. Candidates can spend their donation money on strategy development, polling, speech writing, policy advice, demographic analysis … essentially anything that comes from someone the campaign designates an expert on how to win the election. Staff salaries. Campaigns can pay the canvassers, advisers, writers, media consultants, and others who, in big national campaigns, can sometimes seem legion. Meals, along with anything else the campaign “needs,” which is a notoriously vague category that can often include entertainment, alcohol, and other items most people would deem non-necessities. The breakdown between these categories varies wildly depending on what campaigns feel they need most. 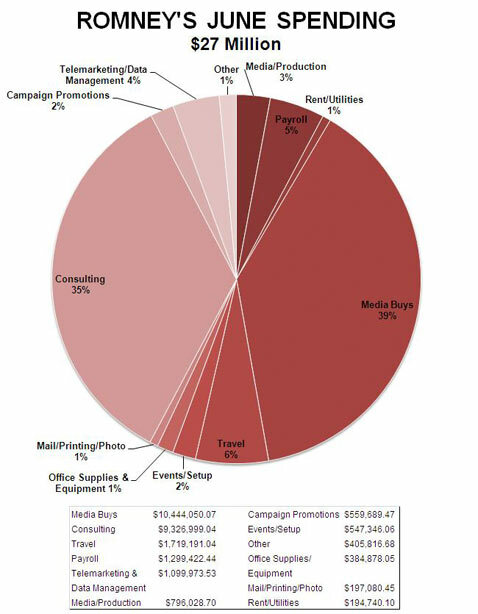 In 2012, candidate Mitt Romney spent his campaign donations with an emphasis on political consulting: more than one-third of his money went to campaign strategists. By contrast, in that same election President Obama spent far more on media buys, especially online ads and a much smaller share on consulting. Although there are many ways to legally spend campaign money, some funds can be left over, and when they are, they inhabit a sort of political purgatory. While campaign funds are not commonly left unused, the bizarre rules that govern these funds highlight just how loosely regulated the entire donation sphere is. Up until a 1989 reform act, candidates were able to legally use leftover campaign money for anything—and many used it as a retirement cushion. Even today, leftover campaign donations can be put to many purposes. For one, they can be rolled over to a candidate’s next race. These rollover funds make up the “war chests” many long-term politicians boast, and that can make unseating them very difficult for challengers. Or candidates can also use leftover money to reimburse themselves for any personal funds they used during a campaign (up to certain limitations that vary by office and how the funds were spent). Candidates are also allowed to donate leftover money to charity, or to return it to funders, though it’s understandably difficult to decide who gets their money back (and how much), so few candidates make use of this option. Interestingly, candidates can also shift unspent funds into their party’s general fund—both John Kerry and George W. Bush did so after the 2004 election. Finally, campaigns can donate their remaining funds to other campaigns, though they must observe the same limits as regular political donations. Unfortunately, secrecy and big spending looks to be the new normal. The law takes a permissive approach to dictating when candidates have to make a decision about how to disburse the money. Seven years after he retired from Congress, Martin Meehan (D) from Massachusetts still has millions in his campaign coffers. Former New York Representative John LaFalce (D) is still making contributions to charity from his account a decade after leaving office. Technically, leftover campaign money cannot be used for personal use, but what constitutes personal use is vague at best. Tom Harkin, a retired senator from Iowa, donated massive amounts to Drake University from campaign funds to establish a policy institute in his name. New Jersey Governor Chris Christie even used campaign funds to cover legal costs during his bridge scandal investigation. What we’ve describe here is only what candidates have to do. There’s a more troubling force out there: politically focused nonprofits that can be use their money for whatever they like, a category of political spending sometimes referred to as “dark money.” Funds from these groups have no disclosure requirements, and their donors can remain anonymous. They are nearly synonymous with corruption and shockingly large contributions. The recent collapse of the coal industry and the subsequent string of bankruptcies from major companies gave us a glimpse into the depths of dark money. While we know the money is out there, opportunities to see behind the curtain are extremely rare. This is an area that’s almost universally accepted as needing reform. An investigation by the Washington Post and the Center for Responsive Politics identified $407 million in spending from 17 Koch Industries-affiliated nonprofits during the 2012 election cycle, an amount roughly equivalent to the total amount donated by all unions nationwide. The Post described dark money networks as more akin to “drug runners and tax evaders” than political donors. Unfortunately, secrecy and big spending looks to be the new normal. Until US election laws—and our mindsets about elections—shift to acknowledge this reality, we will live in an era of nearly boundless political spending by corporations, would-be oligarchs, and those with agendas far beyond the public interest. Like what you're reading? Get the latest Sightline democracy research to your inbox. Thank you for beginning to unravel and illuminate this convolution. My god. Thanks to Steven Sylvester for supporting a sustainable Northwest.